Hike or ride to the top of the Happy Jack Peak. Closest drive to the hole wins! About 160 yards to the hole. 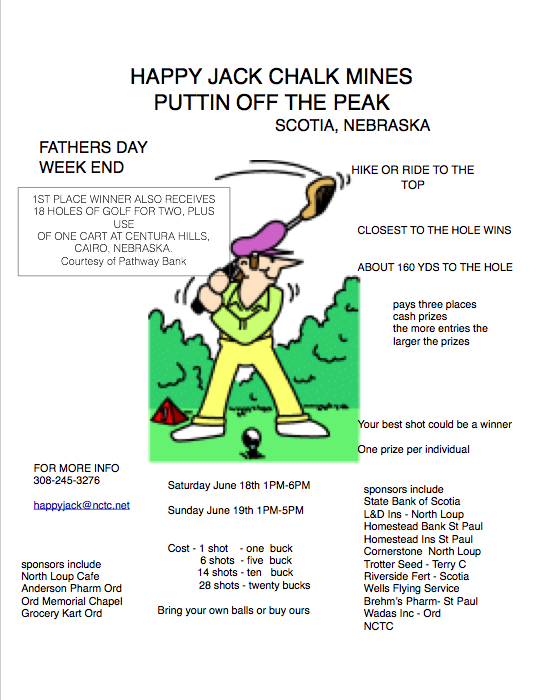 1st place winner also receives 18 holes of golf for two, plus use of one cart at Centura Hills (Cairo, NE). Courtesy of Pathway Bank. Prizes for three places: Cash prizes. The more people who enter will make for larger cash prizes. Your best shot could be the winner! Bring your own golf balls, or purchase ours.